FULTON, NY – Bridget Dolbear, development coordinator for Oswego County Opportunities, has announced that NRG will be a Silver Level sponsor for the agency’s “Giving Thanks” fundraiser. NRG has signed on as a Silver Level sponsor for Oswego County Opportunities (OCO) “Giving Thanks” fundraiser. The event benefits OCO’s “Success4Families” campaign. 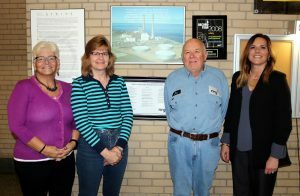 From left are OCO Board Member Patricia Krauss; Paula Clark, budget analyst and Jim Walsh, environmental safety manager at NRG; and OCO Development Coordinator Bridget Dolbear. The event will benefit OCO’s Success4Families campaign, which will help fund a variety of services that feed, clothe and house families in need as well as empower, support and equip families for success. “Giving Thanks” will be held Nov. 2, from 6 to 9 p.m., at the Lake Ontario Convention, Event and Conference Center in Oswego. The event will feature a number of food stations offering autumn inspired delicacies and refreshments from Oswego County’s most popular restaurants including; Alex’s on the Water, Canale’s Restaurant, La Parrilla, The Press Box, Mimi’s Drive-In, The Eis House, GS Steamers, and Tailwater Lodge. Additional stations will offer choices from CiTi Culinary Arts, Appledale Orchards and OCO Nutrition Services. Tickets to OCO’s “Giving Thanks” celebration are $35 per person advance price and $40 at the door and include food, refreshments, and wine and beer tastings. Tables of 10 are also available for $300. You can also log on to OCO’s website, www.oco.org or contact Dolbear at 315-598-4717, ext. 1082.